Black Bean & Corn Salsa is the second Amy's product to be reviewed. Chips and salsa are a staple in my household. Either with a meal or as an evening snack, we burn through jars of salsa at an astounding rate. After quickly finishing off our jar of Amy's Mild Salsa, we dove into the Black Bean & Corn Salsa this week. All of Amy's Salsa's start with organic tomatoes. The remainder of the recipe is pretty simple: onions, peppers, vinegar, salt and spices (all organic). It's this wholesome simplicity that makes me appreciate and enjoy Amy's products so much. The Black Bean & Corn salsa is pretty much the same as the Mild Salsa with two added ingredients. The beans and corn make this salsa slightly more chunky than the regular version. There is no real detectable spicy heat, but the flavors are still fresh and robust. It's another Amy's product that the entire family can feel good about eating. If you like hot salsa (as I do), add a couple dashes of your favorite pepper sauce to your portion or dice up a fresh hot chile. In our house, the 14.7 oz. jar lasted only two days. Fortunately, we've got another jar (medium) in reserve. 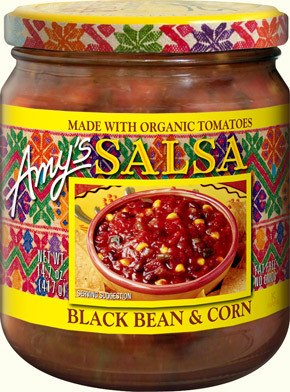 For more information about Amy's salsa's, click here. See how this Black Bean & Corn Salsa rates on our product reviews page. 1 Response to "Amy's Black Bean and Corn Salsa"
My family LOVES this salsa! They can eat it for a meal!